The first challenge is for Facebook Tacky Tuesday Challenge (HERE) which asked for a card with the word "SEA" on it, and the other is for Fantabulous Cricut Challenge Me Monday (HERE) which wanted red, white & blue. There are a couple of other colors on there, but there's definitely red white and blue! And of course, I had to use a wobbly just for my own entertainment! And let's not forget my brand spankin new K Andrew Designs Art Stamps. These are fantastic!!! And my slightly silly video to see the wobbly (I have to work on my video "chatter" LOL). 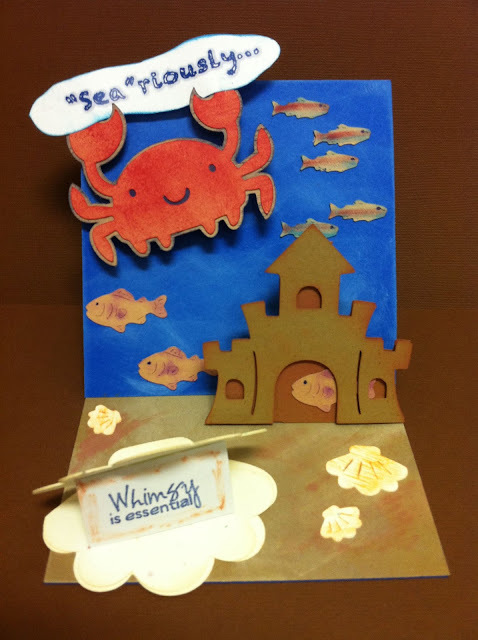 I used Create A Critter and Everyday Paper Dolls for my crab, fish, sandcastle and shells. I use Colorbox chalk ink for the highlights and stamping. As I said, the stamp I used was from the Positive Thoughts set from K Andrew Designs and the "seariously" was computer generated. And my Action Wobble (Find them here). Now I'm off to work on my submission for Simply Sundays at Getting Cricky with K Andrew. I actually won the Face challenge! (So excited!!!!!) Check it out here: K Andrew Simply Sunday Challenge. I also got the Design Team Top 5 at Fantabulous Cricut (Wednesday Winners). Congratulations to everyone else who entered these challenges. I get so much inspiration from you all. Til next time, keepin my fingers inky and my Cricut chirpin! My mom just went through some pretty serious surgery over the weekend. She had a perforated bowel and was in pretty bad shape. Thank God she went to the hospital where they did emergency surgery and she is now recovering. So, of course, it's no surprise I had to make her a little inspirational card. I used the Pagoda cartridge for most the trees, bridge and pagodas. The bridge is sort of 3d (boy, do I love dimension on my cards). The kanji (health) and grass were free svg files. I love having the flexibility to use either cartridges or SCUT. That way I can make sure I get the best of all elements on my projects. I used miscellaneous papers (I'm trying to use up scraps) and chalk inks to color. When y'all are saying your prayers today, I would sure appreciate it if you'd include my mom in your well-wishes. Thanks! Until next time, keepin' my fingers inky and my Cricut chirping. I used my new Pagoda cartridge for the flowers, branches and love tag. Everything was done on black and white cardstock, except the sentiment which I printed on vellum and cut out with decorative scissors. I used a white gel pen to add the date and a little accent at the corners. I also added a "W" brad and stuck on a small rhinestone for an accent. I just love the oriental feel of this card. One of the next projects I am going to be working on is getting some pics of my teeny weeny craft room. Quick! while it's fairly clean and organized. Hopefully sometime next week I can get that accomplished. I change it around so often (depending on what "stuff" I'm working the most with at any given time) so it will be a fun record for me to compare to after the next time I revamp the room. I hope you have a fabulous day. Until next time, keepin' my fingers inky and my Cricut chirping! I updated my June 16th post to include a couple of contest entries. It was too funny that I had made this card last week and then two contests I've come across this week wanted faces and sunshine. Since I had them both covered, I decided to enter the card. Wish me luck! Had another creative evening. Worked 13 hours yesterday and was too darn tired to do ANYTHING. But today, I just new I couldn't stay away from my lil craft room. I have to admit, this card took me about three hours to do. The putting together part doesn't take too long, it's the planning and sizing and laying out. But since I like the end result, I'm going to say it was all worth it. I have a very dear friend who is battling inoperable brain cancer. (Hey, McQzy, if you're reading this, I love ya, girl!) My motivation as of late has been making cards to try and cheer her up. She is amazingly strong and her faith is unmovable. So, along with many prayers, I am trying to let her know how often I think of her by sending her a card every few days or so. There is something a little extra special about this card....You have to see the sunshine wiggle!!! I can foresee MANY a wobbly element on my cards in the future! OK, so, this is what I used for this card (I'm trying to remember to write things down in case anyone is interested, although I'm not to the patience point of tracking cut sizes yet, lol). 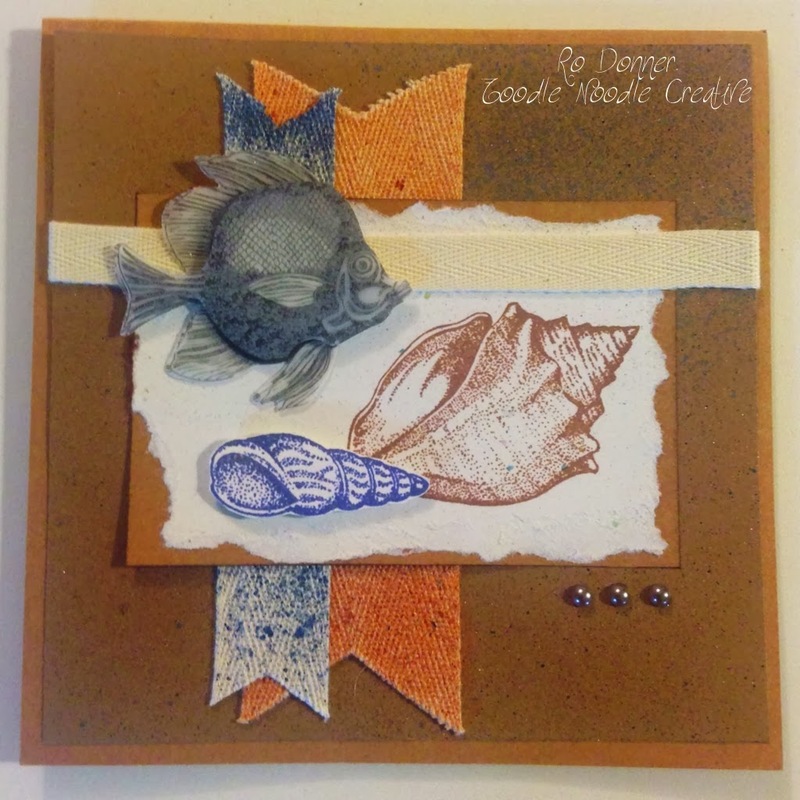 Ink - Colorbox Chalks and Stampin' Up! I have decided to enter this lil card in a contest over at K Andrew. You can find her here: http://www.gettingcricky.com/. Please visit her blog. I'm sure you will find lots and lots of ideas and inspiration there. I also entered it in the Fantabulous Cricut: Challenge Me Monday contest. More fantastic ideas and inspiration. 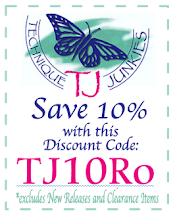 Check them out at: http://fantabulouscricut.blogspot.com/search/label/Challenge%20Me%20Monday. I hope you enjoy YOUR sunshine! Til next time, I'll be keepin' my fingers inky and my Cricut chirpin'! This one was actually a happy accident in a way. For those of you who are interested, I got the layouts from Splitcoast Stampers website. (Here: http://www.splitcoaststampers.com/resources/tutorials/sidestepcard/ ) As I was bustling through the directions, I accidentally scored the wrong side. But I knew I would figure out a layout to use it for. And voila! This happened! I used the Create A Critter cartridge for all the cutouts. The stamp I used for the sentiment wasn't laid out to fit the way I wanted it to, so I stamped and embossed it (twice, once with copper and once with black) and cut it out so it would fit the card layout. I have been in a creative rut lately. My craft room has been in disarray which makes me not want to be in there! I finally got it reorganized. I received a new corner desk from a friend who passed away and finally got that incorporated into my space. Of course, that required a huge rearranging of my room. It's finally pretty much done and I can stand to be in there creating again. I used "blooms" for the stair step card and "simply sweet" for the free floating card. (At least I THINK that's what they're called...lol) I like both cards, but the step one is one of my favorites in a loooooong time. Would love to hear what you think!